To celebrate the launch of Cressida Cowell’s new book in the How to Train your Dragon series, we were given an exclusive Q&A session with Cressida! The ever popular series launches it’s eleventh book “How To Betray A Dragon’s Hero” on the 26th September and is bursting with swash-buckling action, dare devil feats, irreverent humour and Cressida’s own fantastic illustrations. 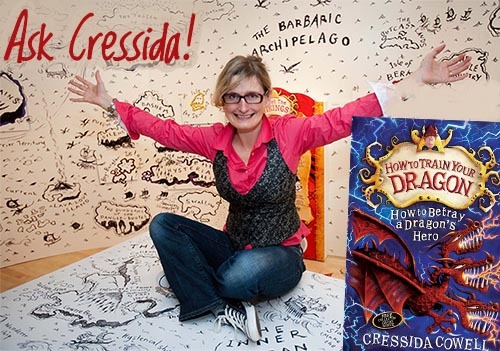 Cressida will also be making a free virtual author appearance across schools and libraries in “Cressida Cowell Live” at 10:30am GMT talking about Vikings, Dragons, her childhood and everything in between! Last week, we asked you if your little one’s had a question for Cressida as LittleBird have been given copies of her brand new book to give away! We’ve had some fantastic questions asked that we put to Cressida over the weekend and she has come back with some brilliant answers. I hate this question because I love writing ALL the characters. It is particularly enjoyable writing characters who have characteristics you really wish you had. For instance I would have loved to have been as naughty as Toothless, or to have had Camicazi’s style and cheekiness and swordfighting skills.I love Toothless the most, but I have a soft spot for Stormfly, the Mood-Dragon owned by Camicazi, the Heir to the Bog-Burglar Tribe. Stormfly first appears in book 6. She is a very beautiful Mood-Dragon, a chameleon who changes colour according to her mood. The ‘How to Train Your Dragon’ books were inspired by the summers I spent as a child on a tiny, uninhabited island off the west coast of Scotland. The island had no roads, houses or electricity, and I used to imagine that there were dragons living in the caves in the cliffs. By the time I was eight, my family had built a small stone house on the island and from then on, every year we spent four weeks of the summer and two weeks of the spring on the island. The house was lit by candle-light, and there was no telephone or television, so I spent a lot of time drawing and writing stories. In the evening, my father told us tales of the Vikings who invaded this island Archipelago twelve hundred years before, of the quarrelsome Tribes who fought and tricked each other, and of the legends of dragons who were supposed to live in the caves in the cliffs. A lot of the characters are inspired by real people in my life. For instance, my own daughters gave me the idea for Camicazi. They’re not as good at sword-fighting as Camicazi, but they’re every bit as chatty. I have always been fascinated by dragons. So were the Vikings. They thought that dragons were magical creatures because they could live in all four elements, earth, air, fire, and water. I think children love dragons and dinosaurs so much for many reasons. One might be that children love the thrill of being scared, and dragons and dinosaurs are so awesomely, wondrously huge, and so magnificently adorned with fangs and teeth. So you have the thrill of being scared, but the comfort of also knowing that they are very thoroughly extinct. I, on the other hand, am a bit of a show-off and in a crisis situation I tend to panic and run around in circles. I love playing games with words. I try to make the names sound like the person they are describing. ‘Snotlout’ is called Snotlout because he has a large nose, and ‘snotty’ can also mean ‘superior and thinking you’re a bit above everybody else’. A ‘lout’ is a brutish, brainless sort of person. I make up the Dragonese in the same way. Therefore a ‘bird’ in Dragonese is a ‘song-munch’, because they sing and the dragons regard them as food. It was amazing to watch the process of the movie being made. It took seven years to make, and the artistry and creativity of the animators, directors, writers, story-board artists, not to mention the actors, was truly astonishing. I love the movie, and so the whole experience has been very enjoyable for me. It is a little mind-blowing to think that a story that began in my head is now giving pleasure to so many people across the world. I think it’s an amazing film. I can’t thank the directors enough. The island is actually very close to my vision in the book. The island it’s based on is Scottish, which doesn’t make sense, but it’s very similar in the wildness of that. Of course, in the book you can’t explain the wildness of it but that’s what’s so wonderful about having the movie, it can paint the picture that you can only really hint at in the book. And particularly Hiccup I just think is a deeply satisfying performance, both acting and animation wise. I had this wonderful history teacher called Miss Macdonald who used to get us to do homework like ‘Imagine you are a child in the Palace of Knossos in ancient Crete’ or ‘Imagine you are Christopher Columbus on the way to America’. Thankyou, Miss Macdonald. I also loved English and Art. I quite enjoyed Maths, even though I wasn’t very good at it, because in Maths there is always a right and a wrong answer, and I wish life was more like that. I read English at university, and I took an M.A. in Narrative Illustration at Brighton. I won a ‘Highly Commended’ in a competition for students called the ‘Macmillan Children’s Book Competition’, and at the awards ceremony I met an editor who published my first picture book the year after I left the M.A. So I was very lucky. HOW TO BETRAY A DRAGON’S HERO is the 11th and penultimate book in the series. The final book should be out next year. Windwalker. I would spend all my time on the back of the Windwalker, chatting to Toothless as we flew above the Archipelago. One of my childhood dreams was to be able to fly on the back of a dragon. Thanks to everyone who sent in their questions, Cressida has picked her favourite questions and they will be receiving a copy of her brand new book! 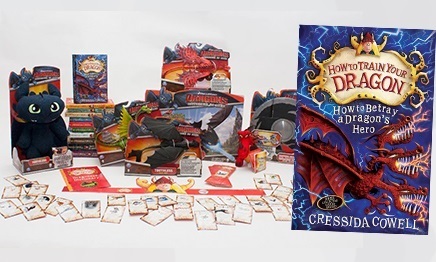 Don’t forget to enter our competition to win some fantastic How To Train Your Dragon goodies worth over £100 including a signed copy of “How To Betray A Dragon’s Hero” which you can enter on our Competitions Page. Finishes on the 26th September!